i am so thrilled to have this opportunity to share this insider news about the man of steel movie premier as part of this sponsored campaign from warner bros.
i find father's day challenging. i want to honor and love on my husband for his special day but we have entirely different ideas for the perfect gift. for mother's day, i'm thrilled to have a few moments to myself. my gifts are usually centered around giving me a break and a few moments away from my kiddos. when I'm home with five of them, who can blame my wish list? my husband, on the other hand, wants to spend quality time with the kids for father's day (who would have thought?) his work schedule doesn't allow for many special moments with the kids and those brief times he gets to spend with the fantastic five in the early mornings and late evenings leave much to be desired. last year he asked for date nights with each of the kids for father's day. the kids loved this idea and they each were able to spend some quality daddy/kid time. this year we are approaching the weekend differently. instead of creating a bunch of smaller outings for my husband and the kids, we are enjoying a weekend of activities we can all enjoy. this works perfectly both for father's day and the first week of summer vacation. it's a win-win! the new superman movie, "man of steel" is coming out just in time for father's day weekend. walmart stores are selling tickets for an advance screening of the movie. this is the perfect kick-off to the father's day weekend. while we won't be taking all the kids, (the movie is not really appropriate for toddlers and no one would appreciate my screaming child in the theaters) we will be able to take a couple of them to enjoy a “grown-up” night out. my husband and older kids are thrilled. 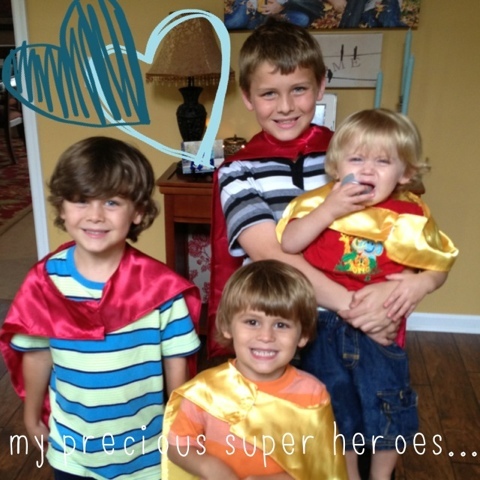 getting our superhero on in preparation. the baby doesn't look amused. good thing he's not invited to this portion of the party. 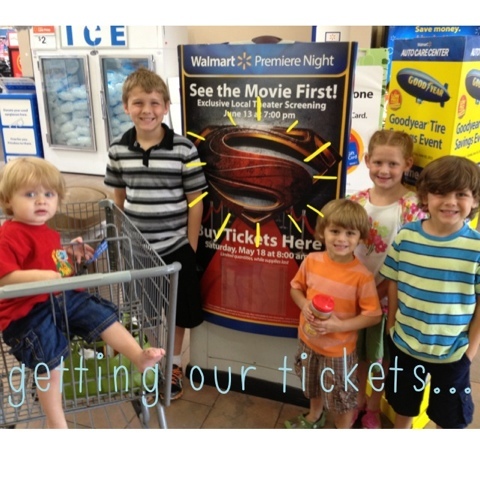 to get your own tickets, you can head to walmart and purchase your man of steel tickets in the electronics department. you will get to attend an advanced screening of the movie and, with the purchase of your ticket, you also get an exclusive digital comic book written by the author of man of steel, in addition to an exclusive opportunity to pre-order an hd digital download or blu-ray copy of the film. the man of steel screening will be shown at specified theaters on june 13th at 7 pm (early enough for some of the kids too). just check your local listings to see when it is playing. you can watch the official trailer here. it is definitely a dad-friendly movie. in my world of boys, it doesn't get better than this. it just so happens that my church planned tailgating at a minor league ball game on friday night of father's day weekend. remind me to thank them for helping me plan my weekend's festivities. we bought tickets for the whole family and we'll all get to sit and watch a game together. with the two little ones, we'll see how long many innings we last. still, totally worth it for some family fun time together. 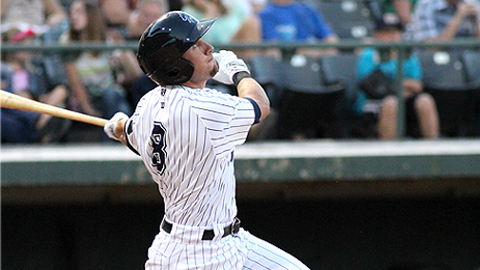 if you have a minor league team in your town, see if there's a home game next weekend. it's a great family night out. if you don't know what this pan is for, wait for the post with the recipe...oh man...is this pan dangerous. sunday mornings are crazy at our house. we leave for church at different times and i'm the first one out the door at 6:20 am. that doesn't leave a lot of time for a father's day breakfast. we make up for it with a saturday morning breakfast. 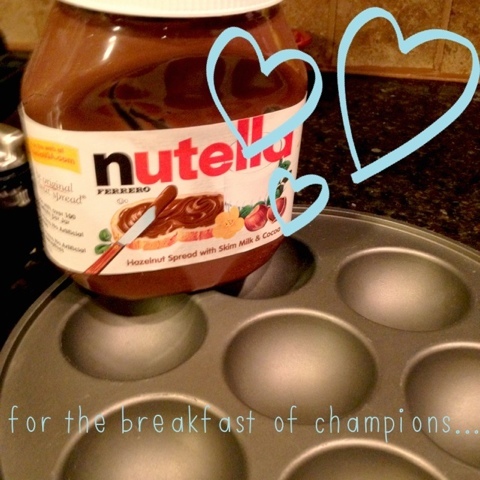 my husband is a sucker for everything sweet so these breakfasts usually involve sugar...and nutella...and butter. there's usually some batter involved in there too but those are the three major ingredients. for this weekend, we are allowed to break all the healthy rules. 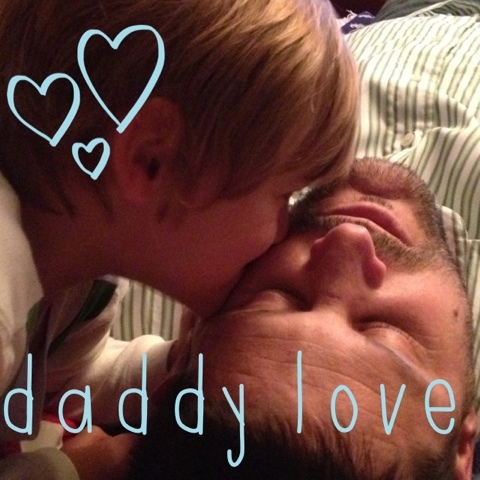 it's an easy environment to shower “daddy” with compliments and guide a conversation to bless him. 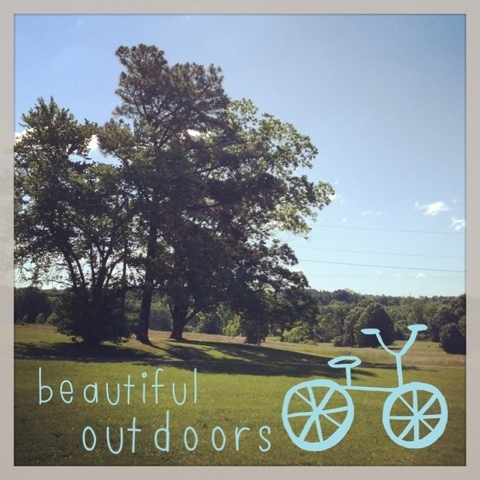 my husband loves the outdoors. he needs to get out of the house and do something away from the “normal” weekend chores and activities. this is especially the case on father's day weekend when he is craving an escape from the routine. after the sugar consumed at breakfast, an outdoor activity is a must. we are planning a trip to a walking path along a river near our house. it's a great place for the kids to ride their scooters and for us to push the strollers and talk. it's family time and grown-up time all in one. it almost feels like a date...just surrounded by children. sometimes we have to take what we can get. my in-laws bought us an outdoor fire pit one year. i have to admit, we don't use it very often but when we do, my family loves it. (i love it except for the smoky laundry i have to wash when we all come indoors...just keeping it real.) 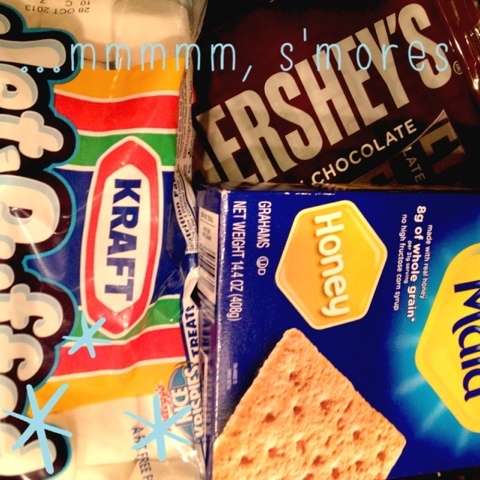 i bought stuff for s'mores. i figure we plan to start the day out with sugar, we might as well end it with sugar as well. it's best to go out with a father's day bang. at some point, my children will go to bed and sleep after the sugar crash. in the meantime, times around the fire are some of the best times we have talking with the kids (we usually put the baby to bed before we start to avoid the worry he would cause around a fire.) they love to talk and laugh and something about the intimacy of the fire opens them up to talk in ways they normally would not. that is father's day goodness wrapped in chocolate and marshmallows. whatever your plans are for father's day, I hope you find time to honor the man in your life and to teach your children to do the same. father's are sometimes the forgotten parent in the grand scheme of things but they are so, so important. my husband is pretty amazing and i'm so excited to celebrate him next weekend. what about you? how will you celebrate the “dad” in your family next weekend? e Electronics Department and include an exclusive digital comic book written by David S. Goyer, author of “Man of Steel”, as well as an exclusive opportunity to pre-order an HD digital download or Blu-Ray copy of the film. Labels: father's day, man of steel, warner bros.